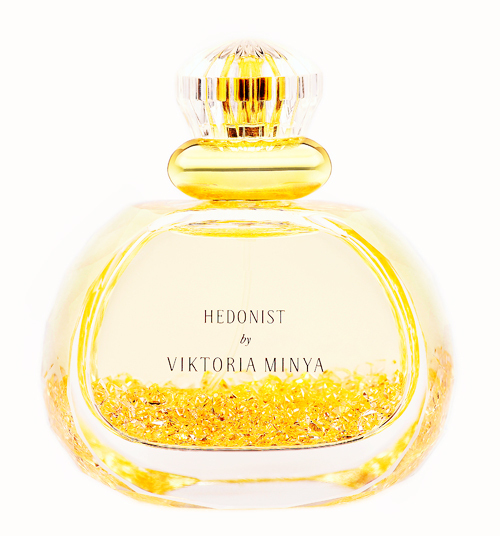 This entry was posted in Florals, Parfums Viktoria Minya, Perfume Review and tagged Hedonist Perfume Review, Parfums Viktoria Minya, perfume review, Viktoria Minya, Viktoria Minya Hedonist Perfume Review by Kafkaesque. Bookmark the permalink. The fact this is a fruity floral feminine scent is what attracts me to it, but peach can be a bit tricky for me. Lovely review my dear. I don’t think it’s actually supposed to be as predominantly peach-y as it turned out to be on my skin. I have the impression that the orange blossom is/was supposed to dominate or be a much stronger thread in the overall tapestry. But, as you can see, skin chemistry is a funny thing and, on both occasions, the orange blossom was very muted on my skin. I think that, if the notes intrigue you, the sample is a great deal, especially given the free shipping. I do think that you’d really enjoy the rich honey notes, but I also know that you’re skittish about orange blossom, Mr. Hound. Oh yes please! 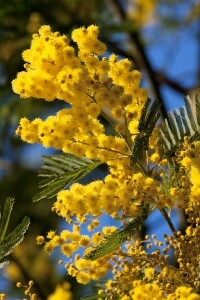 I love honey fragrances and am very lucky that they always smell like honey on me and not . . . well, you know. The bottle and the presentation box are gorgeous! And the perfumer is quite striking. I must confess that I am dying to know what brand mascara she uses. That’s weird, right? 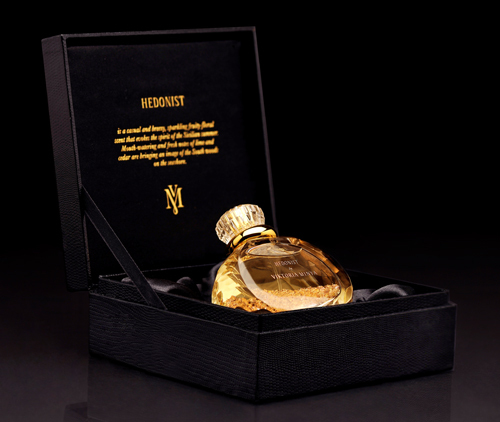 If you love honey — and super rich honey at that — then I would definitely recommend that you try Hedonist! The thing is, this is supposed to be a *orange blossom* scent much more than a honey one! But, on my skin, the Rum CO2 ended up being the strong note, not the orange blossoms, the vetiver or some of the dryer woody elements. You know how much I adore orange blossom, but I didn’t mind one bit that it wasn’t noticeable on me, given the rest of the perfume. I loved the final outcome for how soothing it was. 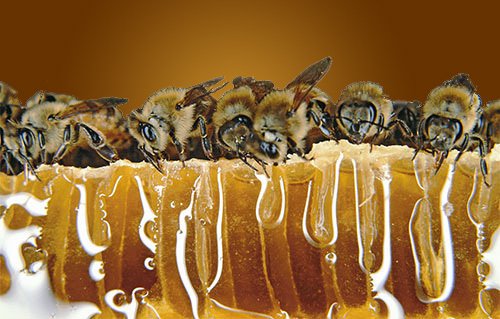 The honey was sooooooo relaxing and comforting. I swear, I think my blood pressure went down a few notches both times I wore the perfume. LOL. As for the perfumer, she’s not only striking but seems to be an incredibly fascinating person, in my opinion. Oxford-educated, then NYC for some companies and HR, then Grasse for many years of perfume education, and more. The Fragrantica interview was really interesting to me. 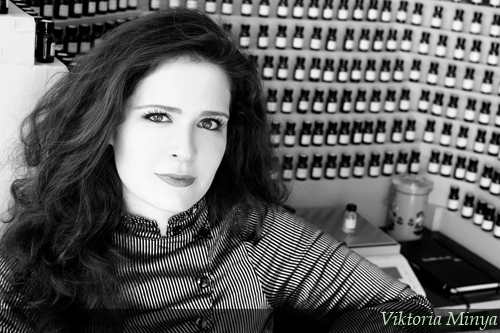 And there is a link on her website to an equally striking photo (if not even cuter) of her.http://viktoriaminya.com/en/about/ But most of all, she seems like an exceptionally nice, incredibly warm person and I hope she goes far with her perfume (or, perfumes, plural, in the future). There is a very classique, rich, luxurious aspect to Hedonist which I greatly appreciated and which I think is becoming a bit rare amongst some perfumes today. HAHA! OMG! Okay, I won’t ask 🙂 I will only say that I am in awe that you found out! L’Oreal One Million Lashes. Got it! Brilliant! What I really like about the brand is that it came out with just one perfume! I think it’s very considerate. Honey perfumes are tricky: some ofthem I love, others do not play nicely on my skin. When Iget a chance I’ll see to which category this one belongs. I completely agree with you, Undina. I am cautious about the honey aspect, but looking forward to trying this. Peach frightens me. I love the smell but on my skin it often brings back memories of cleaning the cat room at the animal shelter. Some peach notes smell like cat pee on me. Not a favorite of mine. Once in a while they are okay though but I’ve learned to always sample first when peach is involved. I love the crystals in the bottle. nautious. I must have had a bad experience with Pledge when I was a child. You had me at orange blossom!!! But the rest of the notes sound absolutely fantastic as well! And that bottle! The bottle is spectacular, isn’t it?! As for the Escada, don’t you hate it when a favorite perfume is limited-edition? Incredibly frustrating. 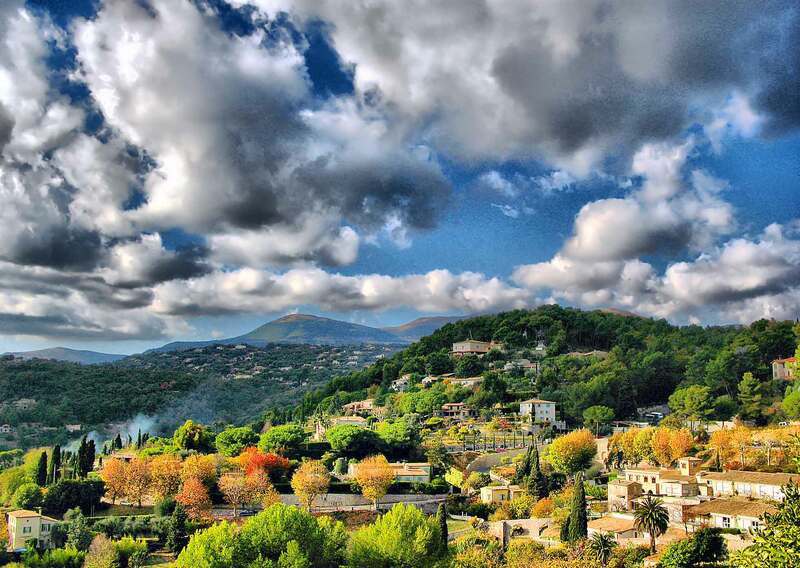 Speaking of Provence, have you ever read Peter Mayle’s A Year in Provence? One of my favorite books on the subject. It made me laugh out loud repeatedly. Given your love of all things British, if you haven’t read it, I definitely recommend it! It takes place in true Provence, as opposed to the more Cote d’Azur parts I know, but it’s a glorious celebration of the area, its food (so much food and drinking in that book, you’ll gain weight just reading it! ), and the culture. I ALWAYS read first and then,if interested, see the movie (and the mean mother that I am make all three of my children do the same!!). All three should be coming in soon so as soon as I complete I will let you know my thoughts 🙂 !! Simply love honey perfumes! I may have to look into this further. O, that explains why I didn’t hear about the line. Sounds quite lovely! Although I, too, have a different definition of hedonism than she does! LOL. The peach note is interesting, as I agree with the other commenter who mentioned it can be a difficult note. 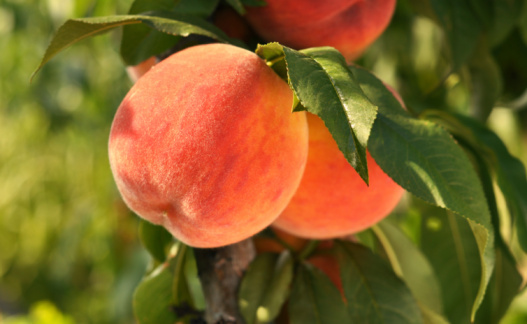 Peach is one of my favorite fruits (and scents), but I think it often can smell very artificial in perfume. Although, to be fair, I haven’t tried many things that had peach notes. I know Mitsouko is famous for its peach note, although to be totally honest, I do not get peach from Mitsouko. Maybe I just need to concentrate more when smelling it, but I don’t smell it. At all. I love it in spite of that fact, though. At any rate, this sounds like it would appear to many people! The packaging is absolutely beautiful. I don’t have problems with peach myself and it’s in a number of perfumes that I adore from YSL’s Champagne to Hermès’ 24 Faubourg, but I know a number of people can find it to be an iffy note, depending on its treatment. I definitely think the perfume is worth testing out for those who love the notes, fruity florals or honey perfumes. And yes, isn’t that packaging stunning? It’s like a little glowing jewel in that dark box. Such a visual feast with such attention to details. Love the Bohemian crystals SOOOOO much! But I suppose all of that is besides the note of this perfume so I should stop rambling. LOL. In theory, this perfume doesn’t sound like something I’d buy or wear, but I will definitely be on the lookout for samples, as this sounds really bright and cheerful. But yes, the packaging is wonderful. I’m sure we pay a pretty penny for that level of loveliness, but I suppose that’s part of the fun in perfume collecting! Wouldn’t be too much fun if they came in sad little oil cans. LOL. 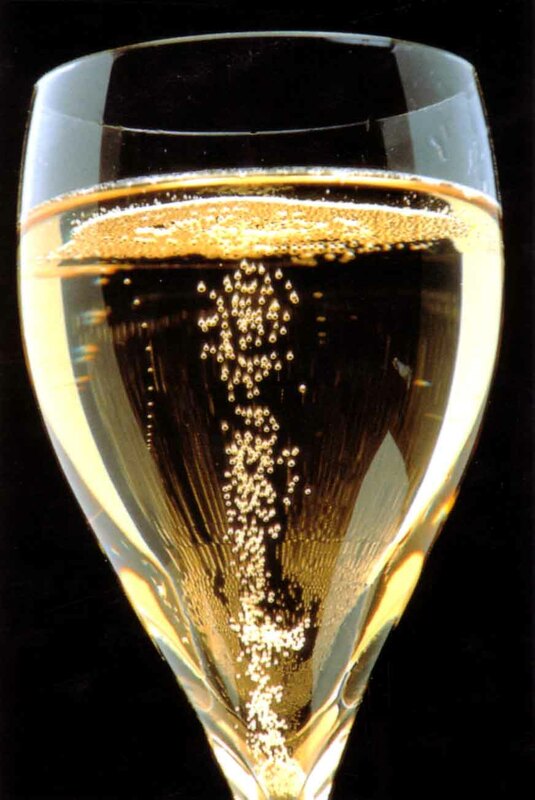 Champagne/Yvresse is discontinued. 😦 But it’s definitely available on eBay where I got my Yvresse bottle (I have some remnants in my Champagne one, but I’m not touching it). I’ll send you some Yvresse (completely the same thing) when I put together your next package. 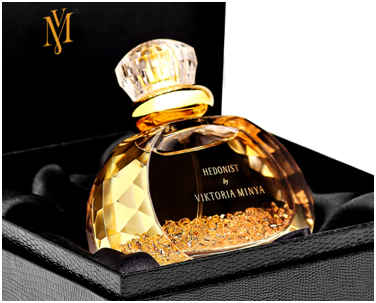 As for the bottle of Hedonist, I think the perfume is very affordable given the ingredients, the packaging and those 500 crystals. There are perfumes that cost $160 which don’t have anything close to this degree of luxe packaging. Montale, I’m looking at you! Ahhhh, I didn’t realize it was GONE! Crazy! Luckily, it’s still quite prolific on eBay (for reasonable prices, though I suppose as time goes by, those prices will become exponentially more unreasonable. Ug.). Ug, don’t get me started on Montale’s packaging. I think it is so, so ugly! That is to say, I knew the name had changed some time ago but I didn’t realized production had ceased altogether! I just looked it up and apparently it happened a while ago. What a bummer. Better stock up! LOL. What else are you yearning for? BTW, have you gotten your decant of Dries Van Noten yet? Even BaconBiscuit said it was all snickerdoodles! As for “Mini-lemming” with this one, is it because others are more dominant in your interests? What’s the main thing you’re lusting for? “mini” for now since I am ordering a sample :-). The others I’ve got my eyes on include Haute Clair, Noontide Petals, Cartier Baiser Vole EDT (I have the EDP already) and actually, I am almost positive I will get a FB of Iris Poudre.. OK, I need to stop. I am still “searching” for my Dries van Noten (a split didn’t work out but I am patient…I may go to Barneys to check it out in the meantime. eeek, this was supposed to be a reply to you! Oh, I’m so glad you’ve found a number of things that are tempting you! Seems like a lot of florals on the list which will be so wonderful for Spring. As for Haute Claire, Mr. Hound’s review of it had me DROOLING!!! It’s definitely one I want to try too! Interesting how the Rum CO2 manifested itself on you. I know rummy scents aren’t your thing. Did you get a lot of peach? Somewhat, yes indeed. It reminded me in particular of a little known Patou, and when I checked it out, it was a big peach production! I’m sure you won’t be surprised when I say ‘I’m in lust for the bottle’!lol I’m such a sucker, for a beautiful bottle! I hope you do, Jackie. 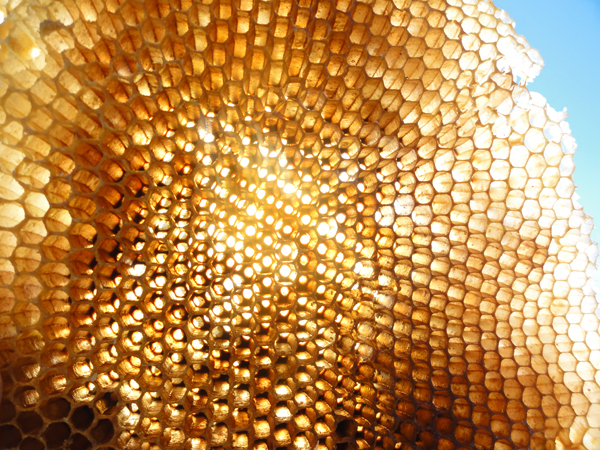 This is such a photorealistic honey and such a lovely perfume. As for that bottle, I haven’t seen it in person but from the photos, it looks jaw-droppingly beautiful! I got my sample yesterday! First sniff impression – wonderful. I will try it this weekend! YAY!!!!!!!!!!!!!! I actually straightened up a little in my chair when I saw that “wonderful.” I’m so glad and can’t wait to hear more after your usual tests! Seriously, I’m so thrilled that your first impression was a very positive one! Hi Kafka, last week I received my sample. I was curious what to expect for a honey accord. I’m a newby and are just learing to recognise all the different fragrances. With the first sniff I immediatly recognised the honey your reffered to however this is not mentioned in the notes. It’s sweet but not cloying, For me it’s a completey different perfume from all others I have smelled till today and I really enjoy it. The dry down works well on me, I keep sniffing my wrist. Unfortunately it will remain a sample as a full bottle is much to expensive for me. But no problem there are a lot of other perfumes I would like to get to know better, and with samples this is a good and affordable way.